Categorized as: Stories on April 2, 2013. A man in a north India village shows what happens after decades of scrounging for unsteady work and meager meals, when simple a change in his ecosystem brings orders to his door. 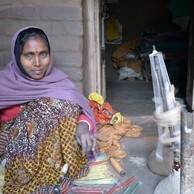 The power of social entrepreneurship connects Shivanandan to his local social-mission weaving business in Bihar, to our jobs-creation partners at Upaya Social Ventures in Seattle, to our U.S. family—who also could not eat if not for a steady paycheck. This story was also published by the Huffington Post; click here to jump to the HP version. Shivanandan with his wife (behind, R) and children. Bihar, bisected by the Ganges River and shadowed by the Himalaya Mountains, used to be infamous for crime, corruption, and lack of infrastructure, yet also famous for the tussar silk weaving of Shivanandan’s heritage. The city of Bhagalpur bears the nickname “Silk City.” Bihar’s current chief minister strives to build education and economic empowerment (13-14% growth in GDP in the past two years). Yet poverty persists here, child malnutrition rates soar, and most educated youth flee to neighboring states for a better life. Shivanandan doesn’t need to see statistics—he’s lived these struggles. Hired initially by Bihar Development Trust (BDT), a local nonprofit organization promoting entrepreneurism and economic development, Shivanandan soon revealed he was far from ordinary. He quickly progressed, showing BDT how successful a weaver could become with a minimum investment in skills training and access to steady contracts. When BDT staff saw what progress this “prototype” go-getter Shivanandan could make when given just a small chance to advance, they launched Eco Kargha. This new for-profit, Upaya-backed weaving company took on all of BDT’s weaving contracts and will continue to build the business in Bhagalpur. Their social mission is to provide hundreds more jobs in Shivanandan’s area and meet the growing demand for woven silk and other fabrics in India’s big cities as well as export markets. Showing what’s possible when a man can access dignified, steady work, Shivanandan now carries the title of “Master Weaver.” He spends three-quarters of his time on the loom, and the remainder overseeing other Eco Kargha weavers. He and his team make embroidered stoles and sarees of expensive silk for weddings and special occasions. Pedaling his bicycle into the office in Bhagalpur, ten kilometers away, Shivanandan checks in three times a week to try and procure more work. The 25 employees in the pilot Eco Kargha pilot program used to make $8 per saree; now they earn $28. They used to work about 90 days per year but now work about 250 days per year. Shy and slow to open up at first, Shivanandan becomes animated and his hands rise and fall as he talks about his plans to buy a motorcycle to get around and sell more wares. He’s built four rooms in his house; it’s one of the largest homes in the village. He wants to paint it in bright colors, in cheerful contrast with the gray cinderblock and brittle thatch that dominate his village. Shivanandan, in the pink headscarf, poses with fellow weavers under the sign for Bihar Development Trust..
As a Master Weaver, he is also involved with Eco Kargha’s sales and plans to build an open-air veranda where customers can visit comfortably to discuss orders for wedding sarees or tablecloths they’d like to order. Instead of eating just powdered Sattu, they now have a variety of rice, roti, vegetables, and even meat. Taking advantage of the skills training provided by his new employer, Shivanandan diversified his weaving designs and became secretary of his local weavers’ trust. And in a lottery-based award system through BDT, Shivanandan got to travel to India’s capital city, Delhi, to visit other artisans in the large Dilli Haat gift-market. Following that trip, Shivanandan—who used to speak only his local dialect of Angika—taught himself Hindi, so he can converse with more customers in many places. In his home-based weaving workshop. Shivanandan is on the right. Shivanandan still spends much of his time on the loom. He craves steady work all twelve months of the year. Advancing from 60 to 250 days of work per year is still not enough to keep his three looms humming or to feed his almost desperate ambition. Many of his neighbors—even some of his coworkers at Ecokargha—complain there’s not enough work to keep food in their bellies. But Shivanandan pushes forward. We’ll let you know how far he expands his sales base once he buys that delivery motorcycle . . . and what color he decides to paint his house.